Surgical repair of Scimitar syndrome (SS) is commonly performed by intracardiac rerouting and direct implantation of the Scimitar vein (SV). In patients with anatomically challenging conditions such as infradiaphragmatic drainage of the SV and positional abnormalities such as dextrocardia and abnormal situs, alternative techniques such as interposition of an extracardiac conduit (ECC) should be taken into consideration. Since January 2005, four patients with SS were surgically treated in our center (two of them had direct implantation and two had an ECC implantation of the SV due to the presence of remote infradiaphragmatic drainage). We present our experience in interposition of an ECC in two patients with remote infradiaphragmatic drainage of the SV. Informed consent to publish the data was taken from the parents. A 14-month-old girl was admitted to our center with difficulty on feeding and failure to thrive. Chest X-ray revealed a crescent-shaped opacity [Figure 1]a. Transthoracic echocardiography and pulmonary computed tomography (CT) angiography revealed a moderately sized secundum-type atrial septal defect (ASD) and an anomalous pulmonary venous structure (SV) draining the right-sided pulmonary veins to the inferior vena cava (IVC) below the diaphragm [Figure 1]b and [Figure 1]c. Cardiac catheterization and aortography revealed pulmonary hypertension (pulmonary vascular resistance: 3 WU) and a large collateral vessel from abdominal aorta supplying the right lung. Coil occlusion of the systemic collateral vessel to the right hilum was performed in cath lab. Surgical repair was undertaken 1 month later. After establishing cardiopulmonary bypass (CPB), the SV was ligated near its connection to the IVC. First, an end to side anastomosis was performed between a 10-mm-ringed polytetrafluoroethylene (PTFE) graft and the SV. Then, aortic cross-clamp was applied and cardioplegia was given. Through the ASD, an end to side anastomosis was constructed between the PTFE graft and the left atrial wall. The ASD was closed using a Dacron patch. Weaning from CPB was done easily with intravenous milrinone and inhaled nitric oxide (iNO, 20 ppm). Post weaning off CPB pulmonary artery pressure was found to be severely elevated causing right ventricular dysfunction and failure despite high dose iNO (60 ppm). The patient was put on central venoarterial (VA) extracorporeal membrane oxygenation (ECMO) (2 L/min/m2). A PA catheter was inserted through the right ventricle. The chest was left open and the patient was taken to the ICU. Her PA pressure tracings improved steadily in the early postoperative period under VA ECMO and iNO. To facilitate the weaning off iNO, oral sildenafil was started through a nasogastric route. On postoperative day 3, the systolic PA pressure was almost half of the systolic systemic pressure. The patient was successfully weaned off ECMO on postoperative day 5 and extubated on postoperative day 7. Postoperative transthoracic echocardiography revealed patent drainage of the pulmonary venous return to the left atrium through the ECC. She experienced sudden cardiac arrest in the ICU on postoperative day 14. She was unresponsive to cardiopulmonary resuscitation. The reason for mortality was regarded as a possible episode of pulmonary hypertensive crisis. A 2-year-old boy was referred to our center with diagnoses of right-sided diaphragmatic hernia, right lung hypoplasia, and an anomalous return of the right pulmonary veins to the IVC-right atrial junction. Chest X-ray revealed herniation of the diaphragm into the thoracic cage on the right side and compression and/or hypoplasia of the right middle and lower lobes [Figure 1]d. Transthoracic echocardiography revealed severe dilation of the right-sided cardiac chambers, a moderately sized secundum-type ASD, and a scimitar vein, possibly draining all of the right-sided pulmonary veins, connecting to the IVC-right atrial junction. Cardiac catheterization revealed pulmonary hypertension (pulmonary vascular resistance: 2.3 WU) and two collateral vessels from the abdominal aorta to the right lung. Coil occlusion of the systemic collateral vessels to the right hilum was performed in the cardiac catheterization lab before surgical repair. Surgical repair was done in a similar fashion. An end to side anastomosis was constructed between the PTFE graft (13 mm in diameter) and the left atrial wall [Figure 1]e. The ASD was again closed using a large Dacron patch. Weaning from CPB was done easily with intravenous milrinone (0.50 mcg/kg/min). iNO and oral sildenafil were given for controlling pulmonary hypertension early postoperatively. He was extubated on postoperative day 7. Oral aspirin (5 mg/kg) was started. Postoperative transthoracic echocardiography and pulmonary CT angiography revealed a patent drainage of the pulmonary venous return to the left atrium through the extracardiac-ringed conduit before discharge and at 6 months after repair [Figure 1]f.
Several techniques such as intracardiac rerouting, direct implantation, and lobectomy/pneumectomy have been described for surgical repair of SS; of which, intracardiac rerouting has been one of the most popular surgical techniques. While its main advantage is claimed to be the tendency of the venous orifice to expand with growth, one cannot underestimate the need for deep hypothermic circulatory arrest, especially in patients with infradiaphragmatic drainage of the SV and positional abnormalities such as dextrocardia and abnormal situs during surgical repair. Moreover, thrombosis or stenosis of the pulmonary venous baffle has been remained a significant complication in the long term. In a study by Najm et al., the risk of pulmonary venous stenosis was as high as 47% at a mean follow-up period of 8.9 years and being operated during infancy was found to be the greatest risk factor. Vida et al. revealed that the risk of stenosis was similar after intracardiac baffle repair and direct reimplantation (almost 15%) at a median follow-up of 4.5 years. The majority of the patients with SV stenosis were asymptomatic in this study. In a study by Alsoufi et al., the rate of freedom from postoperative pulmonary vein stenosis was only 22.4% with intracardiac baffle at the mean follow-up of 10.6 ± 11.1 years. Reimplantation has been another commonly used technique for SS. Several disadvantages with the technique have been described. Firstly, reimplantation mandates extensive mobilization of the SV, especially in patients with dextroposition of the heart. Secondly, acute angulation and kinking of the SV when the right lung is inflated is inevitable due to the almost 90° change in the alignment of the SV orifice after reimplantation. Thirdly, the growing potential of the anastomosis in the long term has remained debatable. In our opinion, one further disadvantage could be regarded as the contractile nature of the left atrial wall that makes the reimplantation technique inherently stenotic. The concept of using an ECC for repair of an anomalously draining pulmonary vein was firstly introduced by Cobanoglu et al. in 1984. The use of a ringed ECC (12–16 mm in diameter) for repair of SS in adults was reported with satisfactory early and midterm by Guerra et al. This technique was also described in two pediatric patients with SS (4 and 14 years old) by Lam et al. They used 13- and 16-mm PTFE conduits, respectively, which were thought to be compatible with adult life. In our opinion, there are several advantages of interposing a ringed conduit in SS. Firstly, it enables repair in anatomically challenging conditions such as the presence of a caudally inserted SV. Secondly, it avoids kinking of the SV at any level during its course. Thirdly, the ringed design exerts radial force that precludes the collapse of the anastomosis between the left atrium and graft during systole. On the other hand, the major disadvantage of the technique could be regarded as the need for oral anticoagulation related to the use of a synthetic material in a relatively low-flow pulmonary venous system. To prevent graft thrombosis, we gave only aspirin and did not anticoagulate the patients postoperatively. Actually, this is our standard protocol for uncomplicated Fontan patients. As the experience in using extracardiac PTFE conduit for SS has been very limited in the literature, the need for anticoagulation after operation remains unclear. Although the outcome in our patients and those reported in the literature has been reported to be satisfactory, the use of a conduit in smaller children/infants who present early needs further research. Wang CC, Wu ET, Chen SJ, Lu F, Huang SC, Wang JK, et al. Scimitar syndrome: Incidence, treatment, and prognosis. Eur J Pediatr 2008;167:155-60. Najm HK, Williams WG, Coles JG, Rebeyka IM, Freedom RM. Scimitar syndrome: Twenty years' experience and results of repair. J Thorac Cardiovasc Surg 1996;112:1161-8. Vida VL, Padalino MA, Boccuzzo G, Tarja E, Berggren H, Carrel T, et al. Scimitar syndrome: A European congenital heart surgeons association (ECHSA) multicentric study. Circulation 2010;122:1159-66. Alsoufi B, Cai S, Van Arsdell GS, Williams WG, Caldarone CA, Coles JG. 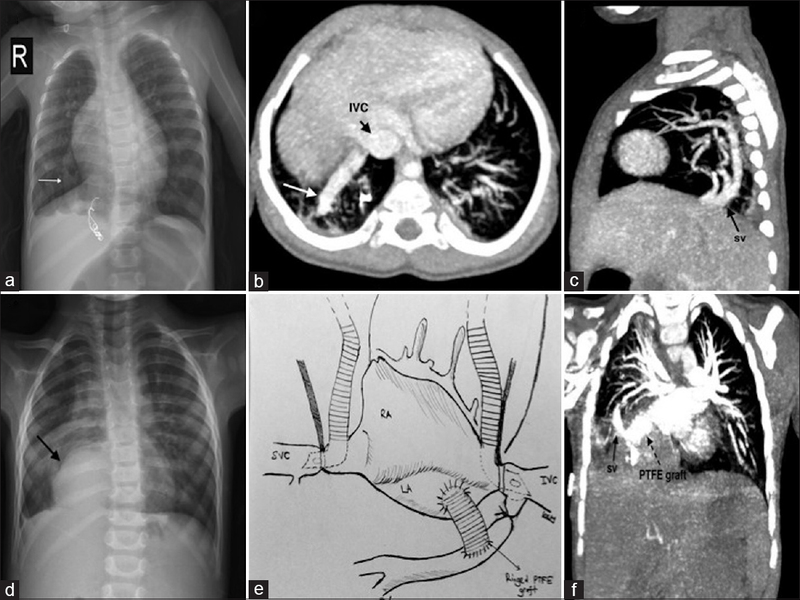 Outcomes after surgical treatment of children with partial anomalous pulmonary venous connection. Ann Thorac Surg 2007;84:2020-6. Brown JW, Ruzmetov M, Minnich DJ, Vijay P, Edwards CA, Uhlig PN, et al. Surgical management of scimitar syndrome: An alternative approach. J Thorac Cardiovasc Surg 2003;125:238-45. Cobanoglu A, Hanlon JT, Combs DT, Starr A. Combined intracardiac and extracardiac repair of scimitar syndrome with anomalous pulmonary veins to both cavae. J Thorac Cardiovasc Surg 1984;88:141-6. Guerra NC, Pernot M, Nesseris G, Al-Yamani M, Roques X, Thambo JB, et al. Scimitar syndrome repair in adults: Intermediate-term results using an extracardiac conduit. Ann Thorac Surg 2016;102:2070-6. Lam TT, Reemtsen BL, Starnes VA, Wells WJ. A novel approach to the surgical correction of scimitar syndrome. J Thorac Cardiovasc Surg 2007;133:573-4.